Studio Ghibli's Ronja the Robber's Daughter is part of a wave of children's TV that also appeals to adults. I am 28 years old, I have no children, and my favorite TV comedy of 2016 was Barbie: Life in the Dreamhouse. It’s not just that this Mattel-produced web series is a flawlessly constructed reality television satire or that its jokes ping with surprising sophistication or even that the storylines intermittently approach Kubrickian heights of technological dystopia. It’s that sometimes, even as an adult, I still need my entertainment delivered in optically bright, narrively buoyant fun-sized portions. In an age when the Sturm und Drang of the current political nightmare threatens to pull us deeper into the muck—and Peak TV’s visceral dramas and mopey auteur comedies only hasten the sinking feeling—children’s TV can do more than cleanse the cultural palate. It has the power to ignite joy and revitalize hope. Fortunately for wonder-starved grown-ups, Amazon has just debuted the English-language version of Ronja the Robber’s Daughter, the first television series from world-class Japanese animation house Studio Ghibli. Directed by Hayao Miyazaki’s accomplished son Goro (From Up on Poppy Hill, Tales from Earthsea) and with a new English-language dub featuring Gillian Anderson as the narrator, Ronja is an emotionally stirring and visually sumptuous adaptation of the 1981 novel by Astrid Lindgren, best known for the Pippi Longstocking series. In the rich tradition of his father’s oeuvre, from My Neighbor Totoro to Spirited Away, the younger Miyazaki’s Ronja is a classic coming-of-age story about a curious young girl who learns to adapt to a wild, magical environment. The 26-episode series, set in medieval Scandinavia, follows the birth and childhood of mop-headed Ronja (voiced by Teresa Gallagher), the beloved daughter of a robber chieftain whose loyal band of misfits stalk the local woods for wealthy travelers. (Think of her as a gentle Arya Stark who happened to be born into an adorable Iron Islands tribe.) They live on a craggy, secluded keep at the edge of a cliff until the fateful day a rival bandit clan takes refuge nearby and Ronja meets Birk, the son of her father’s enemy. Their friendship, and their subsequent journey into the forest, craters the girl’s bond with her blustering father. Ronja is a magnificent protagonist: Stubborn, tempestuous, independent, and openhearted, she is also miraculously allowed to be, at times, just plain wrong. (Compare her to the similarly brave Moana, who isn’t permitted a single moment of selfishness in the entirety of her otherwise gorgeous film.) 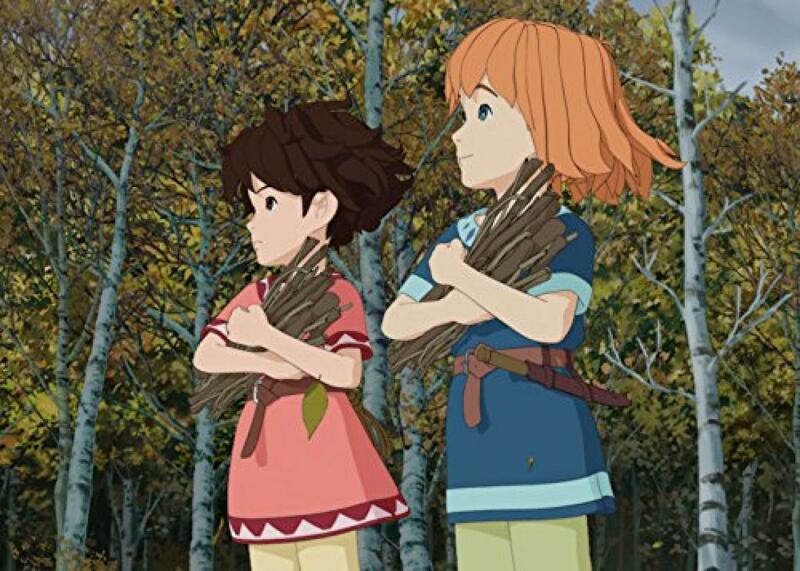 What truly sets Ronja apart from Western-style children’s series, however, is that it doesn’t depend on conflict as the engine of its narrative: Instead, Miyazaki structures the story around “experience” in the style of kishotenketsu, an Eastern storytelling device that relies on a slow burn of exposition and contrast to incrementally build toward a twist and a resolution. There there are times when it seems like not a lot happens, but it’s satisfying enough to see a child frolic, swim, jump, or fly. Ronja transports us into an immersive, sunbathed world whose rhythms are defined by its protagonist’s discoveries, both jubilant and frightening. It is as feminist, pacifist, and environmentalist as any of Studio Ghibli’s earlier works, weaving a message of tranquility into its soothing artistry. The computer animated cel shading creates a fluid, semi-photorealistic look that at first makes the world seem less delicate than its hand-painted cinematic forbears. But peer closely and you will notice the telltale green and blue watercolors of the intricately drawn woodland landscapes. In the wake of the inauguration and the global women’s marches, Ronja acts as an antidote to despair in which a young, independent female stands her ground and triumphs over her father’s bullying and egomania. In the end, love trumps hate. Amazon has emerged as a leader in a crowded field of online streaming platforms rising to compete with network, cable, and public broadcasting stalwarts that have held a stronghold over kids’ TV for decades. We are now seeing major growth in toy-based television series that harkens back to the unregulated 1980s, when half-hour toy commercials dominated the airwaves. (Think Transformers, Strawberry Shortcake, et al.) The Children’s Television Act of 1990 cleared the way for more educational programming on network and cable, but online streaming is still the Wild West, a new frontier for toy manufacturers to spread their brands. Even so, the technological innovations and progress of educational research-based television series have led to an artistic renaissance in these toyetic programs. Expectations are higher than they were in the ’80s, and there’s more competition than ever, so these programs are upping their game accordingly. Shows like Netflix’s Ever After High (based on the Mattel doll series), Amazon’s WellieWishers (based on the American Girl toy brand), and YouTube’s DC Super Hero Girls employ striking animation, engaging writing, and girl-power feminism to tell their stories. I know I am not the only person who retreats to children’s television as both an intermezzo to intense adult programming and a meditative exercise during periods of stress. In the last year, I’ve heard friends and acquaintances rattle off their favorite kids’ programming, Steven Universe, Adventure Time, and Gravity Falls among the most popular choices, and I’ve seen enough Tumblr pages and Arthur memes to sense that we’re not the only adults partaking in nostalgia and joy. (Just ask your average Brony or Whovian.) But the mechanisms behind this trend seem to go beyond a few friends sharing a joint and watching Animaniacs, The Powerpuff Girls, or reruns of H.R. Pufnstuf in their dorm rooms back in the 1990s. With near-boundless digital access at our fingertips, American millennials who grew up during the era of Clintonian stability can take a reprieve from the current grief-focused state of television to enjoy the simplicity of their childhoods, either by viewing the classics or enjoying newer programs with matured eyes. And most significantly, we can do so in private, on our computer screens, without the judgment of our peers. Children’s TV is glorious escapism for adults, but it’s also a reminder of human basics: goodness, empathy, patience, and caring for ourselves and others. From the Zen charm of Sarah and Duck to the pep of Peg + Cat¸ these shows often provide lessons in resilience. And it’s not just the young at heart who have taken notice: Take a look at Peabody Award winners of the last few years, and you’ll see an uptick in the recognition children’s programing: Scottish delight Katie Morag, Disney’s revolutionary Doc McStuffins, and Pakistani superhero cartoon Burka Avenger have been among the recent honorees. A dose of cute, a sprinkling of weird, a glimpse of the remarkable: With the worries of the world growing heavier every day, sometimes you just want to sit back and watch a little girl soar through the air.